I have been using hot hide glue for years. Hide glue is the oldest and most traditional of all the glues used in woodworking. I prefer 192 gram strength clear as it has a little more open time and yet is quite tacky. I have several glue pots. I have a traditional brass double pot, a Hold Heat pot (I float mason jars in it when I need larger batches), and a lovely reproduction of a Landers, Frary & Clark glue pot first made in the 1870s from France. This last pot is probably my favorite go to pot. It only holds 1 oz of glue which is great for most of my day to day work. 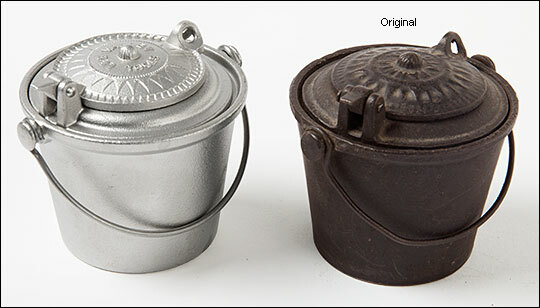 My reproduction pot is made of stainless steel instead of the original cast iron to prevent rusting. It is available from Lee Valley Tools. Hide glue is an adhesive made out of the connective tissues, bones and hides of animals (mainly cattle) that have gone to the slaughterhouse. It’s extracted by “cooking” raw stocks to obtain glue liquors that are filtered, evaporated to glue solids and then dried before grinding. When you buy hide glue, it comes in hard yellow-orange granules or pellets. To prepare hide glue for use, you have to soak the pellets in cold water for several hours until they soften and become gelatinous. Heat the water to 140°F. Be sure to use a thermometer, as it’s important to maintain this temperature. If the water gets too hot, it will overheat the glue and cause it to lose strength. It’s a good idea to stir the glue mixture occasionally to help work out any lumps but it’s not absolutely necessary. After a few minutes, the pellets will be melted and the glue will be ready to use. A properly prepared and heated batch of glue forms a steady thread as it drips from a brush back into the glue pot. If the glue drips from the brush in droplets, it’s too thin. If the glue forms thick clumps on the brush, dilute it with hot water until the desired consistency is achieved.